It seems some of you have an interest in my speeding ticket, so here is some additional info. The speed limit in the Park is 35 and drops to 25 or increases to 45 on occasion. I thought I was in a 45 mph zone, but was in a 35mph zone and happened to pass one of the many “speed traps” the Rangers seem so fond of around here going 52 mph. It is a Federal Ticket, which means if I don’t pay it, the US Marshalls will come knocking on my door, but as such, it also means that my home state of AK should never hear of it, which in turn means that my Insurance company should never hear of it. Thank goodness because as many of you already know, my driving record is quite colorful without this added bonus. Alright, back to more photos taken over the past few days. The next day I spent in the Canyon area and may have the name of the waterfalls mixed up, but here they are. This first one is Tower Falls, I think. And I think this one is Upper Falls. 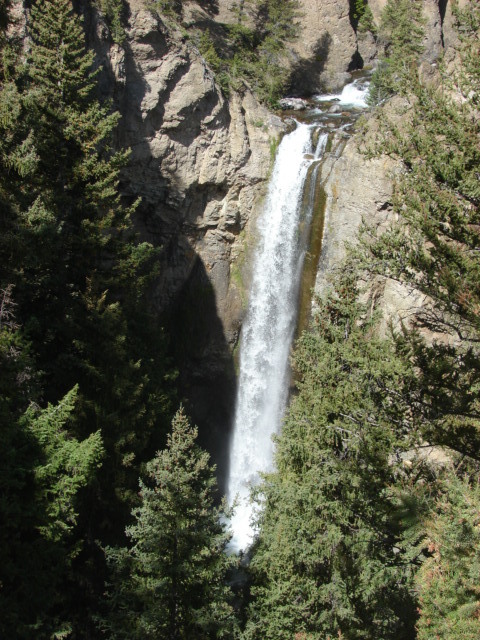 Either that or the Lower Falls, or maybe even this is the Tower Falls. I can’t remember, but isn’t it pretty? 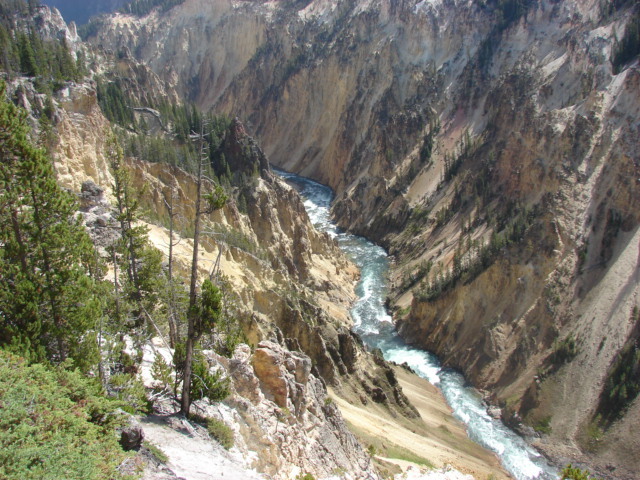 And this is the Canyon that the Yellowstone River is squeezed through after dropping over several sets of Falls. 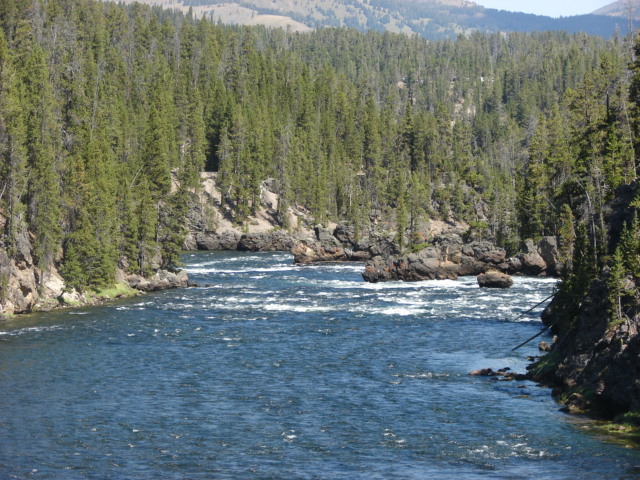 This is the Yellowstone River just above the Falls and Canyon. 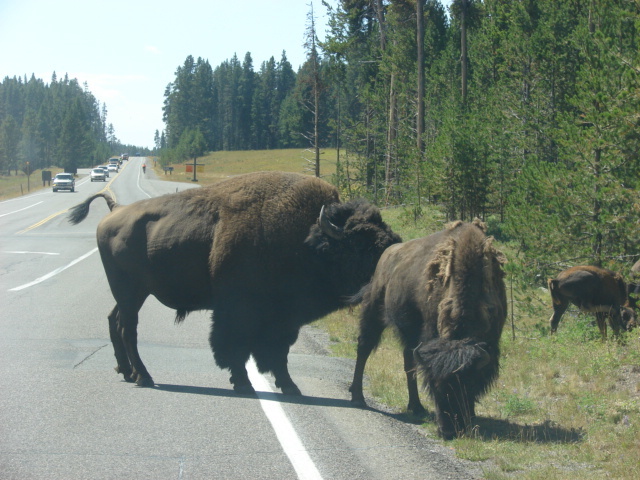 And on the way home, a number of cars were held up due to this Bull Bison courting a cow first on one side of the road, then the other, then in the middle (they kept wandering between the cars). The Bull was about the size of Lil’ Pea, maybe a little taller. So, let’s see, I guess that brings us to yesterday. The Lone Star Geyser day. 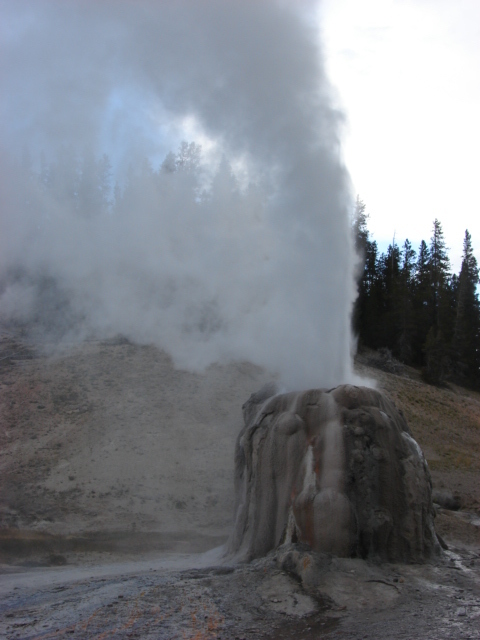 And here is the Lone Star Geyser in all its glory and unlike Old Faithful, it erupts from a cone. And here the three of us are before the storm hit. I forgot to mention earlier that it hit when we were about a third of the way back to the car. Thunder, lightening, rain, and hail. Yes, hail. Everyone say hello to Dan and Joanne! And that brings us to today. My last day in the Park. 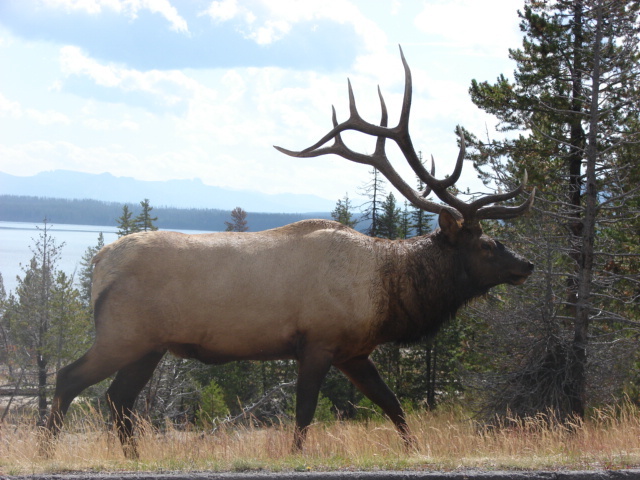 I decided to check out the West Thumb Geyser area which sits on the shores of Yellowstone Lake and look what I saw on the way. Now do you think this guy would break a record? I’m inclined to think so. No, its not a statue. 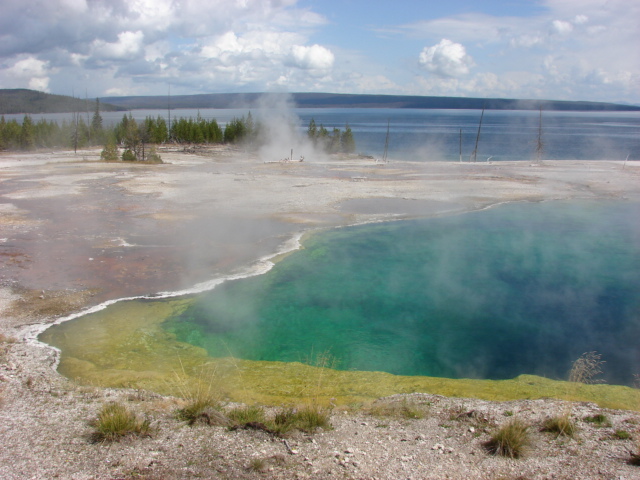 Here you see one of the deepest Hot Springs in the Park with Yellowstone Lake in the distance. Again you can see the different colored micro-organisms living at different temperature levels and notice how clear the water is. If you look, you can really see quite a distance down. 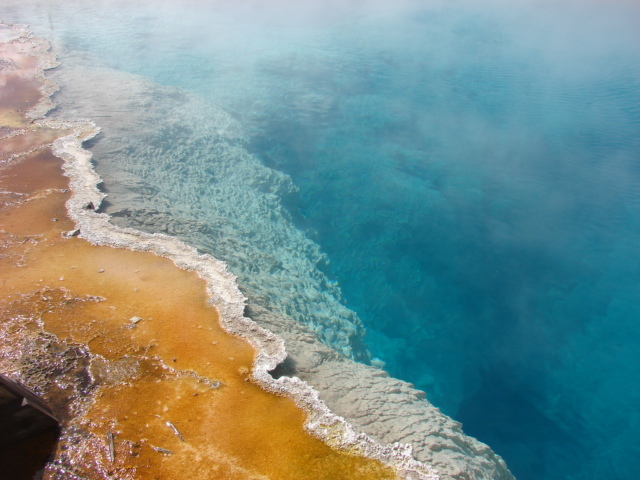 To me, this hot spring looks like a photo taken from outerspace. You can really see down deep in this one. I love the story of this one, whose name I have already forgotten. 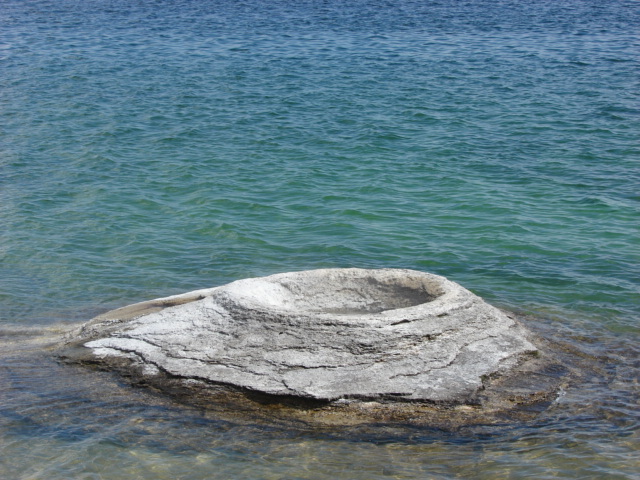 It’s nickname, however is Hook and Cook because back at the turn of the century, people would stand next to it and catch a trout in the lake on a long pole, then swing the pole over the Geyser and dip the fish in it, thereby cooking it without ever taking it off the line. Of course they don’t allow this practice anymore due to damage to the cone and injuries etc. Its the afternoon here and another storm has blown in, which I’m told is supposed to bring snow, but at the moment has only brought rain and wind. I’m off to the Teton Natinoal Park and Jackson Hole, Wyoming tomorrow. It’s only about a 2 hours drive from here, which will be nice. 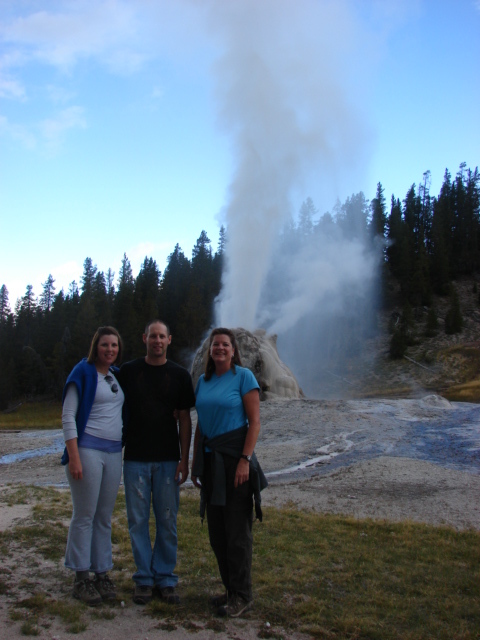 Love the Lone Star Geyser photos–I’ve never had an opportunity to experience anything like this. The “different colored micro-organisms living at different temperature levels” are amazing. 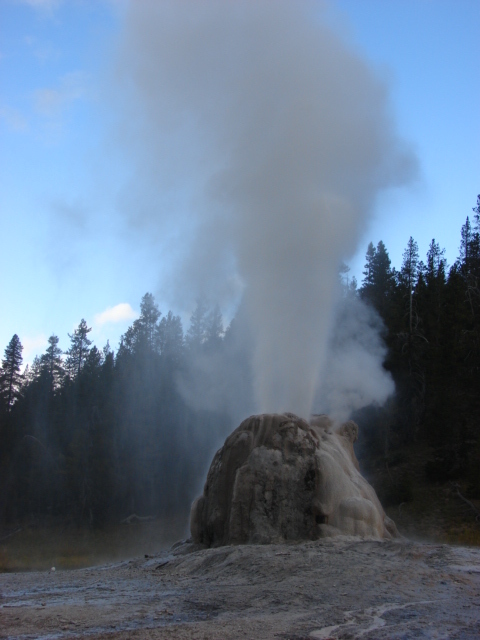 Just did some research– “half of the world’s geothermal features and two-thirds of the world’s geysers are concentrated in Yellowstone” (!!!! )…and about those “micro-organisms”:—-one bacterium produces an important enzyme …useful in replicating DNA…” and their retrieval makes no impact to the ecosystem (!! )…other ‘bacteria in the hot springs may… help to cure …various diseases’. I love Wikipedia. 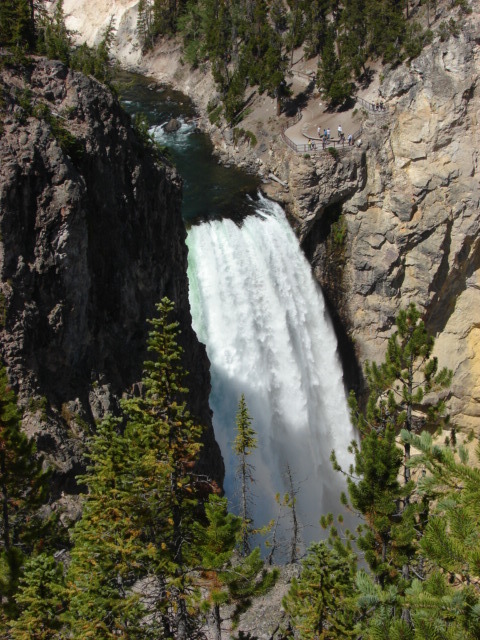 Yellowstone is awesome, especially as seen through your beautiful photos! 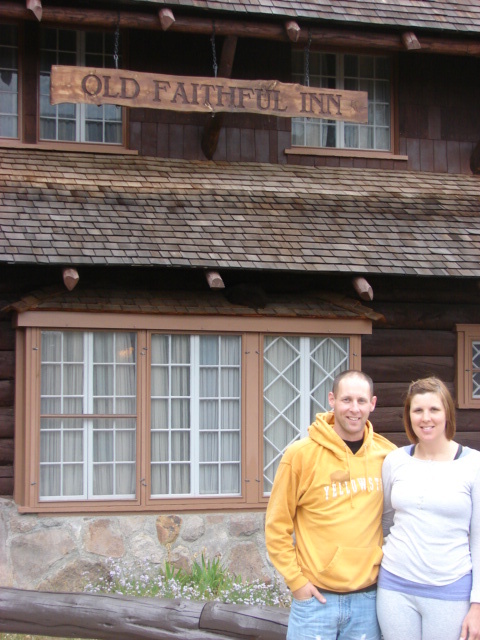 Dave and I stopped there for a day or two on our way up to Alaska, back in ’85. I don’t remember seeing any of the geysers other than Old Faithful though. We must have stayed for too short of a time to see everything. Hope you’re enjoying the Tetons! !